Maynard H. Daniel, age 87, passed away on Wednesday, April 10, 2019 at Central Baptist Hospital in Lexington, Kentucky after a brief illness. Maynard was born in Marfork, West Virginia on February 4, 1932 to Blaine Daniel and Della Sparks Stanley. In addition to his parents, Maynard was also predeceased by his first wife, JODY, daughter-in-law Linda Daniel, grandchildren JimDoug Charles and Jennifer Chapman, sisters Betty, Louise, Mary and Jackie and brothers George, Vernon, James, and Bill. In his younger days, Maynard was an excellent athlete in many sports. After graduating from Marsh Fork High School, he was drafted as a pitcher for the Detroit Tigers--however, he always reminded those around him that Uncle Sam won the draft so instead of playing major league baseball, he served our country. Maynard was a proud Korean War veteran. Having been assigned as front-line marksman, Maynard saw first-hand the consequences of war and while believing that wars were sometimes unavoidable, he also believed in countries trying to resolve differences without war and form coalitions to make our global world a better place for all people. When he returned from the service, Maynard began working in the coal mines while also attending college at night. He received a Bachelor of Science in Business Administration degree from Morris Harvey College in Charleston, West Virginia. After graduating from Morris Harvey on August 17, 1962, Maynard taught school for a few years. He enjoyed sharing stories of his brief teaching career and all three of his children from his first marriage have successful careers in teaching and coaching. In November of 1956, Maynard married Jo Alma (Jody) Anderson and together they raised three children, all of whom survive him and live in West Virginia. Greg, Perry (Lori) and Lori (Jimmy) Jarrett. Maynard was very active in his children's lives and coached Greg and Perry in various sports. Later in life, Maynard could often be found playing rounds of golf with his boys, a sport that they continued to enjoy and share a fondness for Maynard's entire life. Lori was a "Daddy's girl", especially after the death of Lori's mother, Jody, which occurred when Lori was only 10 years old. During Jody's illness, Maynard and his mother-in-law and sisters-in-law provided loving care for Jody. After her death, Maynard committed his life to raising his little girl and they remained close through the years. Maynard was very proud of Greg, Perry and Lori and he loved to recall memories of their childhood and his time with Jody as they raised and enjoyed their three children together. As an extension of his children with Jody, Greg, Perry and Lori blessed Maynard with six grandchildren: Miranda, Alyssa, Carlie, JoBeth, Taylor, Kirsten, and Brayden and one great-grandson, William. In West Virginia, the name 'Maynard Daniel' is synonymous with the UMWA. Perhaps there was no one prouder of the goals and accomplishments of the United Mine Workers of America. Maynard dedicated his life to UMWA service and retired after 35 years of serving as Secretary/Treasurer of District 17. He was widely respected for his integrity, strong work ethic, and overall pleasant personality. And yet, when he needed to exert a strong voice and/or actions of behalf of UMWA members and their best interests, Maynard was on the front lines fighting for those causes. Even at this death, Maynard was still a trusted auditor for several local unions. During his time with the UMWA, District 17 merged with District 30, which was headquartered in Pikeville, Kentucky. It was after this merger that Maynard met his second wife, Jean Pinson Charles, who had been a secretary at District 30 for many years. Jean had also lost her first spouse and so Maynard and Jean found friendship and companionship with one another and on October 8, 1994, they married in Pikeville, Kentucky and lived there for fifteen years. Maynard and Jean retired together from the UMWA on March 31, 1996 with Maynard having over 35 years of service and Jean with 31 years of service. This year, Maynard would have been eligible to receive his 60-year 'miners pin'. Jean survives Maynard and this October. They would have celebrated their 25th wedding anniversary. With the marriage to Jean, Maynard gained more children and grandchildren and loved them as if they had been his all along. In like fashion, Jean's three children quickly adopted Maynard as their 'bonus' Dad and were very involved in his life and he was in theirs. Surviving children from Maynard's second marriage are Rick (Phyllis) Charles, Doug (Mitzie) Charles and Marsha (Brenda) Moors-Charles. Surviving grandchildren from this second family are Jordan (Jessica), Johnathan, Hollie, Lauren (Matt), Savannah, Paxton, Cody, and Kayden and great-grandchildren Jacob, Hannah, Lilly, JT, Jessica, and Jensen. Maynard lived a simple life--based on family and solid principles. He was soft spoken and gentle; kind and generous, loving and thoughtful. He enjoyed playing golf and as an 82-year old, made a 'hole in one'. When he could no longer actively play golf, you could find him watching golf--and analyzing players' swings and results. In 2010, Jean and Maynard moved to Lexington, Kentucky, where he resided at his death. First in Pikeville and then later in Lexington, Maynard caught the spirit of the University of Kentucky basketball program and became an avid fan of both the men's and women's teams. As with golf, sharing a broadcast of a basketball game would mean that you'd hear Maynard coaching from his recliner--even known to change the channel if his teams were playing carelessly. Maynard stayed interested in football and basketball programs at both West Virginia University and Marshall University as a nod to both his own roots and that of his children and grandchildren. A drive-by of Maynard and Jean's home in Lexington would spot a West Virginia rocker on one side of the porch and a Kentucky rocker on the other side. As we celebrate the life of this great man, it is with heartfelt sorrow that we will no longer have his physical presence. And yet, we are comforted to know that he now lives in an eternal presence and is at peace and free of pain. Maynard was not very vocal about his faith--yet his belief was evident in how he lived and how he treated others. 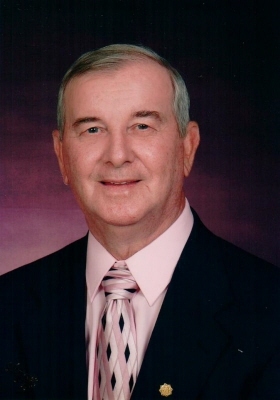 He was baptized in the First Baptist Church of Pikeville and after moving to Lexington, Maynard was an active member of Bluegrass United Church of Christ where his daughter Marsha currently serves as Senior Minister. In honoring Maynard's roots in West Virginia and his final years in Kentucky, Maynard will be celebrated with services in both states. On Saturday, April 13, 2019, Maynard's family will receive visitors from 11:00 a.m. - 1:00 p.m. at Bluegrass United Church of Christ, 500 Don Anna Drive, Lexington, Kentucky. A service will follow visitation at 1:00 p.m. with Rev. Kenny Bishop presiding. After the Kentucky service, the family will travel back to West Virginia, accompanying Maynard back to the mountains from which he came. Maynard will be celebrated at Armstrong Funeral Home in Whitesville, West Virginia on Sunday, April 14, 2019. The family will receive visitors from 12:00 p.m. - 2:00 p.m. at the funeral home with service to follow. Officiated by Rev. Sonny Williams, husband of Maynard's niece, Patty. After this service, Maynard will be interred at Pineview Cemetery beside the grave of his deceased wife, Jody. Pallbearers will be sons Greg, Perry, Rick, and Doug; son-in-law Jimmy; and grandsons Jordan and Brayden. The family wishes to express their deepest thanks to friends and family for all of their cards, messages, and phone calls during Maynard's brief illness and especially to the nurses, staff and Dr. Theresa Case at Central Baptist Hospital, ICU 2nd floor. Their kindness and loving care of Maynard and the family will always be remembered. In lieu of flowers, contributions can be sent in Maynard's honor/memory to: Bluegrass UCC, 500 Don Anna Drive, Lexington, Kentucky 40510 with notation "Caring4theKids", an outreach program of his church which provides basic necessities for elementary kids living in poverty in Central Kentucky.